Nevada was hit harder than any other state when Wall Street greed crashed our economy. 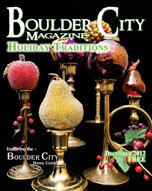 Families in Boulder City and elsewhere were devastated, and many lost their jobs and their homes. I have worked hard to improve Nevada’s economy and believe that the reforms we implemented in President Obama’s first term have helped to strengthen Nevada and set us on a path toward long-term economic success. But there is much more we can do to put Nevadans back to work and improve our economy. In the years ahead, I look forward to working with my colleagues in Congress, both Democrats and Republicans, to make sure we create an economy that’s built to last. We can secure our long-term recovery by building on recent job-creating measures and by maintaining strong support for clean energy development. Nevada small businesses need opportunities to expand and hire workers. We made progress when I worked to pass the American Recovery and Reinvestment Act in 2009 which directed hundreds of millions of dollars in loans and tax cuts to Nevada small businesses. More than $500 million helped to keep teachers in Nevada’s classrooms, and more than $38 million was directed to Nevada law enforcement to keep our communities safe. As we work to create jobs, we must also make the cost of living more affordable. The Affordable Care Act (ACA) helped our state regain its economic footing by improving coverage for insured Nevadans and keeping insurance companies from discriminating against those with pre-existing conditions. This law will continue to help Nevadans save money in the years ahead. In Boulder City in particular, increasing our investment in clean energy innovation will create jobs and put our state on the path toward energy independence. Nevada is at the forefront of the clean energy industry, and we must work toward a clean energy future so all Nevadans have cheaper and cleaner sources of power. Nevadans have worked hard to overcome the recent hardships, and we have an opportunity to maintain momentum during President Obama’s second term. I will continue to fight to help strengthen our economy for all of Nevada.